Yes it is as odd as it sounds. Idli can work wonders on your skin and how. Well not idli so much as idli batter. It is granular enough to clean your skin and gentle enough to not cause any harm. It did make my skin softer. So here is how I do it. Mix all the ingredients for the scrub together, add hot water to the mixture to get the green tea powder to release all its goodness into the mixture. Leave this mixture for 2-3 mins before you apply it to your face, just to give the tea some time to brew. Apply this mixture on a lightly steamed face. Leave it on for 10-20 minutes. Then moisten the pack and start scrubbing in circular motions and wash the pack off. Today I will talk about a simple deep moisturising hair spa. It is simple, it combines most of what you already know and it helps. But it also can get a little smelly. 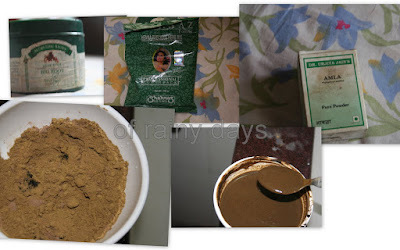 Grind hibiscus and tulsi leaves and the flowers too and apply the paste on your scalp. You can strain the juice and just massage with the juice too. Leave this mixture on your scalp for 30- 40 mins. Tulsi kills the germs and does the job of an astringent while hibiscus leaves add shine, nourish and help darken your hair. (We all use the flower in hair oil, the leaf is just as good if not better.) The flower adds a nice tinge to your hair so it is a good idea. This tinge wont interfere with any colouring you have used before, because the flower is not a strong dye.